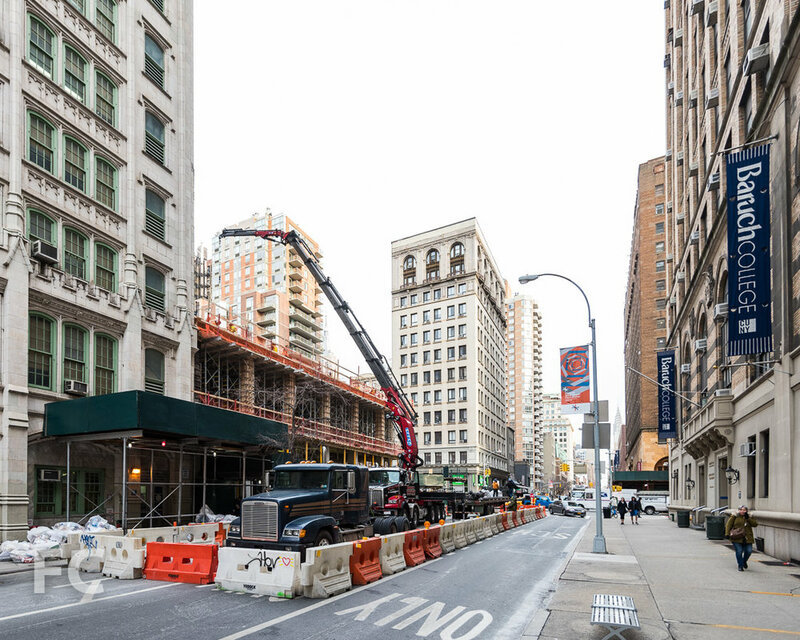 Construction is underway at 121 East 22nd Street, the two-tower residential development in the Flatiron District from Toll Brothers City Living and Gemdale Properties and Investment. OMA's New York office, led by partner Shohei Shigematsu, is responsible for the design of the 18-story residential tower, the firm's first in the city. The larger tower will rise 18-stories at the corner of East 23rd Street and Lexington Avenue. Addressing the neighborhood's pre-war architectural context, the facade features a punched window design that transitions to a faceted northeast corner with glazing that frames views from multiple angles. The smaller tower is located mid-block on East 22nd Street and features a faceted facade similar to the larger tower's northeast corner. Construction on the project is slated for some time in 2018. Intersection of Lexington Avenue and East 22nd Street.